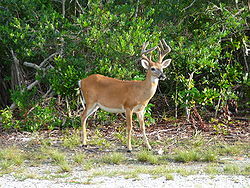 The Key deer (Odocoileus virginianus clavium) is an endangered deer that lives only in the Florida Keys. It is a subspecies of the white-tailed deer (O. virginianus). It is the smallest North American deer. This deer can be recognized by its characteristic size, smaller than all other white-tailed deer. Adult males (known as bucks) usually weigh 25–34 kg (55–75 lb) and stand about 76 cm (30 in) tall at the shoulder. Adult females (does) usually weigh between 20 and 29 kg (44 and 64 lb) and have an average height of 66 cm (26 in) at the shoulders. The deer is a reddish-brown to grey-brown in color. Antlers are grown by males and shed between February and March and regrown by June. When the antlers are growing, they have a white velvet coating. The species otherwise generally resembles other white-tailed deer in appearance. Key deer easily swim between islands. Living close to humans, they have little of the natural fear of man shown by most of their larger mainland relatives. The deer are often found in residents' yards and along roadsides where plants and flowers grow. This often results in car-to-deer collisions, as the deer are more active (and harder to avoid) at night. Seeing them at dusk and dawn is not unusual. The range of the Key deer originally encompassed all of the lower Florida Keys (where standing water pools exist), but is now limited to a stretch of the Florida Keys from about Sugarloaf Key to Bahia Honda Key. Key deer use all islands during the wet season when drinking water is more generally available, retreating to islands with a perennial supply of fresh water in dry months. Key deer inhabit nearly all habitats within their range, including pine rocklands, hardwood hammocks, mangroves, and freshwater wetlands. The species feeds on over 150 types of plants, but mangroves ( red, white, and black) and thatch palm berries make up the most important parts of their diets. Pine rockland habitat is important, as well, because it is often the only reliable source of fresh drinking water (Key deer can tolerate drinking only mildly brackish water). Habitat destruction due to human encroachment causes many deer to feed on non-native ornamental plants. 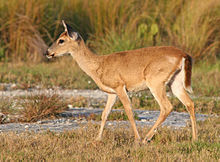 The Key deer is a subspecies of white-tailed deer which migrated to the Florida Keys from the mainland over a land bridge during the Wisconsin glaciation. The earliest known written reference to Key deer comes from the writings of Hernando de Escalante Fontaneda, a Spanish sailor shipwrecked in the Florida Keys and captured by Native Americans in the 1550s. 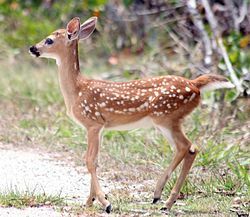 A juvenile Key deer is called a fawn. Due to proximity, most Key deer have lost their fear of humans. This, besides habitat loss, is the main reason why they have become endangered. Key deer were hunted as a food supply by native tribes, passing sailors, and early settlers. Hunting them was banned in 1939, but widespread poaching and habitat destruction caused the subspecies to plummet to near-extinction by the 1950s. The National Key Deer Refuge, a federally administered National Wildlife Refuge operated by the Wildlife Service, was established in 1967. Recent population estimates put the population between 700 and 800, putting it on the list of endangered species. Road kills from drivers on US 1, which traverses the deer's small range, are also a major threat, averaging between 125 and 150 kills per year, 70% of the annual mortality. However, the population has made an encouraging rise since 1955, when population estimates ranged as low as 25, and appears to have stabilized in recent years. Still, recent human encroachment into the fragile habitat and the deer's relatively low rate of reproduction point to an uncertain future for the subspecies. ^ Harley, Stephen A. Miller, John P. (2002). Zoology (5th ed.). Boston [etc. ]: McGraw-Hill. p. 28. ISBN 978-0070294110. ^ "Deadly fly larvae infests federally endangered Key deer population, more than 40 are euthanized". FLKeysNews.com. 2016-10-03. Retrieved 2016-11-01. ^ "Attack of the flesh-eating screwworm pushes up Key deer death toll". Miami Herald. 2016-10-19. Retrieved 2016-11-01. ^ "Healthy Key deer may be corralled to save herd". Miami Herald. 2016-10-31. Retrieved 2016-11-01. ^ "Flesh-eating fly outbreak that infested rare Key deer is over, feds say". Miami Herald. 2017-04-12. Retrieved 2017-06-23. ^ Parker, Israel; Lopez, Roel; Silvy, Nova; Davis, Donald; Owen, Catherine (September 2011). 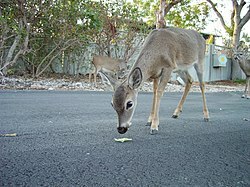 "Long-Term Effectiveness of US 1 Crossing Project in Reducing Florida Key Deer Mortality". Wildlife Society Bulletin. 35 (3): 296–302. doi: 10.1002/wsb.45. Retrieved February 5, 2019. ^ "Key Deer Information". National Key Deer Refuge. U.S. Fish & Wildlife Service. Retrieved February 5, 2019. 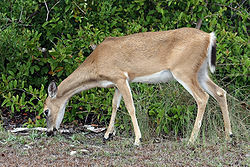 Wikimedia Commons has media related to Key deer.